UNITED NATIONS, Dec 1 2017 (IPS) - Out of 300 nominations from across the globe, just four have won an innovation award for their commitment to human rights. Now in its 12th year, the Nelson Mandala-Graça Machel Innovation Awards seeks to celebrate and promote diverse individuals and organizations for their excellence and bravery in creating social change. “Awards like this are so significant because the winners truly are ‘sparks of hope’ with the poten-tial to inspire many others. It’s important that those of us with the freedom to speak out, use our voices to lift up these courageous individuals and organisations,” said Graça Machel of the initi-ative. This year, the awards form a part of the #WalkTogether campaign which aims to celebrate such ‘sparks of hope’ and inspire compassion and empathy at a time when fear, xenophobia, and hate speech threaten global freedoms and unity. “There is no easy walk to freedom anywhere and many of us will have to pass through the valley of the shadow of death again and again before we reach the mountain tops of our desires,” Nelson Mandela once said. The awardees, who will be honored at the upcoming International Civil Society Week in Fiji, were selected across four categories: youth activist, individual activist, civil society organization, and brave philanthropy. “Equally, when profiling great work in the area of social change, we need to be acutely aware of any bias – intentional or otherwise – toward recognizing white Westerners, or else we risk rein-forcing the type of systemic inequality that is at the core of many of the issues we are seeking to address,” he added. At just 19, Jubilanté Cutting founded the Guyana Animation Network to help empower young people with skills in media and animation. Guyana is one of the poorest countries in the Western Hemisphere and has a youth unemploy-ment rate of almost 40 percent. With the dream of developing Guyana’s digital and creative industries, Cutting was honored to to receive the youth activist award under the names of Mandela and Machel. “I could never have imagined that I would one day receive an award named in honor of these heroes,” she said. Khaled Elbalshy, who won the individual activist category, is a prominent Egyptian human rights defender and journalist fighting to protect free speech. The North African country has increasingly cracked down on the press and has since become one of the world’s biggest jailers of journalists. Some spend years in detention without being charged, while others face long jail terms or the death penalty after unfair trials. One of the most well-known cases is that of Mahmoud Abu Zeid, also known as Shawkan, who was arrested in August 2013 after he photographed security forces’ violent retaliation against protestors during the coup d’état. He remained in prison for almost three years without charges and finally in March 2016, he was charged with six offenses and now faces the death penalty. Elbalshy himself was detained in 2016 and sentenced a year later for harboring journalists wanted for expressing critical views against the government. “This Award is a powerful recognition of all who are defending freedom of the press in Egypt. It is also a message to the more than 20 imprisoned journalists that their voices are still able to penetrate even the walls of prison,” Elbalshy said. Civil society organization category winner Mentally Aware Nigeria Initiative (MANI) is working to raise awareness, de-stigmatize, and promote services on mental health. Mental health around the world is severely underfunded as low-income countries and lower-middle-income countries allocate only 0.5 percent and 1.9 percent of their total health budgets to mental health, respectively. Winning the brave philanthropy category, German-based Guerrilla Foundation is an alternative funder supporting grassroots activists and movements. Their most recent grantees include Campaign Bootcamp, which aims to build and sustain a di-verse community of campaigners and activists, and Ende Gelände, a grassroots movement that organizes civil disobedience actions against coal mining and use in Europe. “Courage in philanthropy is truly lacking and it is a field that craves bravery far more than it knows. We hope to give a nudge – or thrust – to that end,” said foundation advisor Ivan Juric. Mackay urged for others to inspire change like those being honored. “Remember that the biggest change often begins with the smallest actions…never lose sight of why and who you are doing it for,” he told IPS. The Nelson Mandela-Graça Machel Innovation Awards are led by the global civil society alli-ance, CIVICUS. This year, the awards have run in collaboration with The Elders, a Nelson Mandela-founded group of independent leaders working together for peace, justice, and human rights. The Elders, which include former Secretary-Generals Kofi Annan and Ban Ki-moon, launched the #WalkTogether campaign on their 10th anniversary. This article is part of a series about the activists and communities of the Pacific who are re-sponding to the effects of climate change. 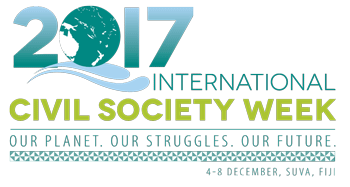 Leaders from climate and social justice movements from around the world will meet in Suva, Fiji from 4-8 December for International Civil Society Week.